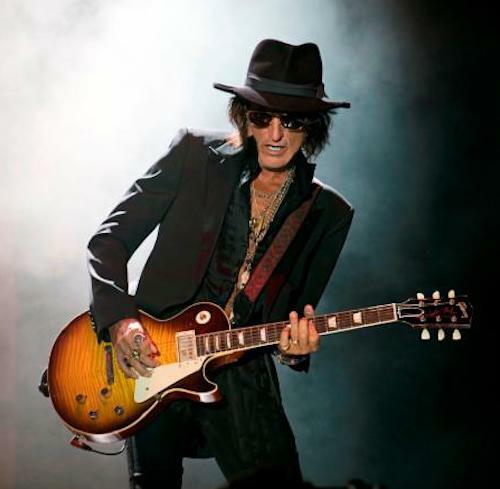 Joe Perry–legendary guitarist, co-founding member, principal songwriter and co-producer of Aerosmith–has just announced a new single, video and tour dates with his Aerosmith bandmate Brad Whitford and Gary Cherone of Extreme. Quake featuring Cherone is being released today (November 9th). The hard-charging track with Perry’s killer riffs and Cherone’s gutsy vocals is from soon-to-be-released vinyl-only version of Perry’s Sweetzerland Manifesto (Roman Records) and was debuted live earlier this year (January 16th) when Cherone joined Perry at the latter’s two-hour plus set at The Roxy Theatre in Los Angeles, CA. The Quake video features Perry–the essence of cool–alone with his guitar and amp, firing up the song alongside the lyrics and a super-hip dancing couple who embody the tune’s freewheeling rock & roll spirit. It was directed by JOE’s son Roman Perry. Watch it below. Perry and his band will perform the song live on his upcoming headlining dates which begin November 30th in Iowa and include stops in New York, Detroit, Philadelphia and more before wrapping up with three Los Angeles-area shows. These performances follow gigs this past April where PERRY debuted his new touring band featuring Whitford and with Cherone of Extreme taking on the lead vocals. Along with choice cuts from his catalog of solo records, Joe will perform rarely played Aerosmith classics from the band’s early records including Toys In The Attic, Get Your Wings and Rocks, among others. Sweetzerland Manifesto marks Joe’s sixth solo album and is comprised of ten new tunes all written or co-written by the guitarist (many with the album’s guest vocalists), except for a cover of Eve Of Destruction with Perry on lead vocals and Johnny Depp on drums. The album features guest appearances from a long list of his friends, colleagues and rock and roll icons. Highlights include Aye, Aye, Aye, which he co-wrote with the track’s vocalist Robin Zander,and three collaborations with David Johansen, who sings I Wanna Roll, Haberdasher Blues, and I’m Going Crazy, plus as many co-writes with Terry Reid whose lead vocals light up I’ll Do Happiness (with Zak Starkey on drums), Sick & Tired and Won’t Let Me Go. It’s catchy, but I like the live performance much better! When you have a catalog like Aerosmith, you don’t need new music! And nobody replaces Steven Tyler, nobody! Cool song. Looking forward to the san fran show.